Largehearted Boy: Book Notes - Barney Hoskyns "Small Town Talk: Bob Dylan, The Band, Van Morrison, Janis Joplin, Jimi Hendrix and Friends in the Wild Years of Woodstock"
Book Notes - Barney Hoskyns "Small Town Talk: Bob Dylan, The Band, Van Morrison, Janis Joplin, Jimi Hendrix and Friends in the Wild Years of Woodstock"
Barney Hoskyns' Small Town Talk is a fascinating history of Woodstock, New York and its place in modern American music lore. 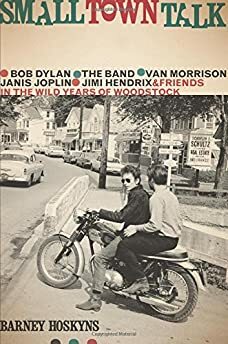 "A fascinating history and behind-the-scenes examination of life in the small town of Woodstock…This title will appeal to those who are looking for a detailed account of the bohemian lifestyle, as well as to fans of Sixties rock." This 12-song playlist tells the story of Woodstock's rock & roll heyday – when Dylan, the Band, Van Morrison, manager Albert Grossman, and many more headed upstate to get it together in the country. The spirit of the "basement tapes" incarnate. A rollicking, nonsensical response to 1967's summer of love – out of which Dylan and his Canadian henchmen had so happily opted. Like many of Bob's Big Pink songs, "Bash" is all chattering verses and gorgeous, almost hymnal choruses, with Dylan bolstered by the white-soul voices of Rick Danko and Richard Manuel. One of the great American singers, wired for sound at his Woodstock home on an inchoate album of devotion – to his wife and son – that concludes with this rambling paean featuring fellow Catskills import Paul Butterfield on harmonica. Morrison expresses his newfound joy and freedom after a nightmarish stint on Bert Berns' Bang label in New York. Influenced by Dylan's and the Band's "I Shall Be Released", this Moondance track is a gospel-rock song of euphoric rebirth as the Ulsterman builds a new life at the top of Woodstock's Ohayo Mountain with wife Janet Planet. The dark and doomy flipside to Bobby Charles' rather more blithe "Small Town Talk": over Rick Danko's ominous fretless bass, the Band's three great singers testify to the oppressive gossip of a town that's become almost claustrophobic to them. From New Morning, my fave Dylan song of all time: a beautiful ballad about wanting to settle down with his family in the country. Dylan never sang so movingly or vulnerably – perhaps the result of a cold – and producer Al Kooper maintains it's Bob's greatest piano playing ever. Another Self-Portrait has a version with strings and harp. From an early release on Albert Grossman's Bearsville label, a superbly funky track by the southern draft-dodger who laid low in Canada – and made his eponymous first album there with the assistance of Robbie Robertson, Levon Helm, and Todd Rundgren. Janis finally had her dream band on Pearl, the posthumous album overseen in LA by Doors producer Paul Rothchild. They never sounded tighter or funkier than on this driving gem composed by Woodstock couple John and Johanna Hall. Revel in the stunning piano fills by Richard Bell, later a cornerstone of the post-Richard Manuel edition of the Band. A startling piece of '70s bluegrass, this is the song of a cast-out woman sung in Dalton's piercing hill-Bilie-Holiday voice and accompanied only by her banjo and Bobby Notkoff's chilling electric fiddle. The sound of Appalachian dread and loneliness transposed to the Catskills and beloved of fans from Nick Cave to Devendra Banhart. I'd choose Charles' "Small Town Talk" itself, but this dreamy ballad really sums up what people were hoping to find in Woodstock. On the run from a trumped-up drugs charge in Nashville, bayou bard Bobby finds refuge in the streams and mountaintops of his adopted Catskills – "a place I'd feel loose," as he sings it. And boy, did he get loose in Woodstock. A sort of credo for the wanton life of '70s Woodstock, where many did find pleasure and were brought low by it – Butterfield and bandmates included. It's an ultra-funky slice of Bearsville rock'n'soul that features Butter backed vocally by his Better Days bandmate Geoff Muldaur. This Bobby Charles song opens Muddy's Woodstock Album, the result of Levon Helm's inviting him to the wintry Catskills in early '75. The king of hard Chicago blues growls away with his disciple Paul Butterfield – and tuba man Howard Johnson – all blowing toughly behind him. In the vein of the many limpid, almost artless ballads Rundgren wrote in the early '70s, the self-styled "hermit of Mink Hollow" expresses wistful regret for the end of his relationship with model girlfriend Bebe Buell. It's a heartbreak classic that took Todd back into the Top 30.